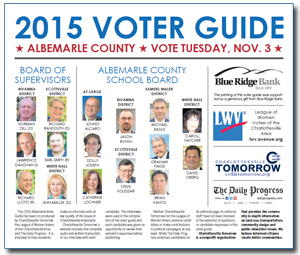 Brian Vanyo is a candidate for the Samuel Miller District seat on the Albemarle County School Board. Five of the seven seats on board will be determined in the Nov. 3 election. Other candidates in this race include: Michael Basile & Graham Paige. Bio: Brian Vanyo is a husband and father of three girls. He was raised in North Dakota, where he attended public schools. A graduate of the U.S. Naval Academy, Brian served in the Navy for 9 years as an F-14 Radar Intercept Officer and also as an Air Defense Analyst. He moved to Charlottesville in 2007 to pursue a law degree at UVA while finishing a Master’s degree from the U.S. Naval War College. Brian is a published author and columnist. He currently works at the Defense Intelligence Agency and serves as a board member of an educational nonprofit organization.